Innovative Seamless toe, softer synthetic fibers and improved fit! Our competitors must use the term "virtually seamless" because they use an under the toe seam, outside seam, or just a low profile seam. Our flagship feature is a true seamless toe that is hand-linked so you can see where the seam was sewn but you will not be able to feel a variation in thickness. We encourage you to experience the difference, and see how comfortable a Hand-Linked toe seam can be! Our Dri-Sport fiber is a new synthetic fiber with a softer feel. 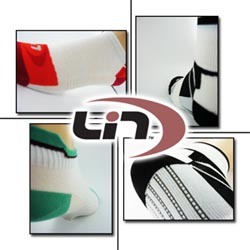 Meaning your synthetic socks don't have to feel synthetic anymore. Also, on the subject of comfort, we added an arch support mid-section to keep the sock in place during active use, an added bonus for people who prefer the low cut look but were afraid to give up the benefit of a tall elastic cuff for support. Think of it as the "strapless bra" of socks. We also have a heel tab design to prevent chaffing from tall heel cups. For those who prefer the tall cuff, we've got you covered. . . and then some! Our new cuff has a more relaxed fit and is coupled with arch support and our seamless toe. So it's comfortable and wicks moisture, we also included 8 channels along the foot bed (where gravity coaxes moisture) to increase surface area for evaporation and create passageways for air travel within the shoe. If you have any questions or would like more information please feel free to contact us at 888-430-9888 and ask for Steve (steve@linmfg.com). We will be exhibiting at the Sea Otter Classic in Monterey, CA April 17-20, 2008 @ booth #109, so come by and let us show you our new products and designs! Stay Comfortable, Stay Dry, and enjoy the ride! Enjoy 10% OFF when you order online during the month of April!